What do you do with the leftover coffee? If you’re like my husband, you’ll pour it down the drain. The man will not reheat coffee in the microwave! If you’re like me, you won’t let that magic potion go anywhere else but in your cup. Reheated or fresh, coffee is coffee. Ever have that morning when you just want to drink your java down without waiting for it to cool? Man, sometimes that seems to take for.ev.er, and then there’s that constant blowing on it, too. Sheesh! You could put regular ice in it, but then it gets all diluted, and who wants watered down coffee? 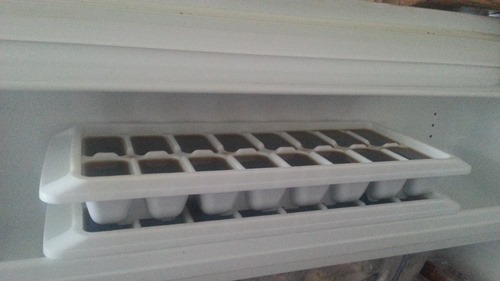 Coffee cubes will cool your coffee without diluting your brew. I end up making a batch every 3 or 4 weeks. Sometimes I have enough room in the freezer to put the cube trays on a cookie sheet to keep them level while they freeze. Most times I just make a couple trays and stick them in the door. I have to be careful though – nothing like spilling that coffee all over the place because you opened the freezer door too fast, lol. I have used warm coffee in the trays, but never fresh. I’m sure the plastic won’t melt, but I guess I just don’t want to chance it. Mostly I use the cold, leftover coffee from the day before. Just make sure to give the trays a quick spray with a non-stick spray so the coffee cubes don’t stick. 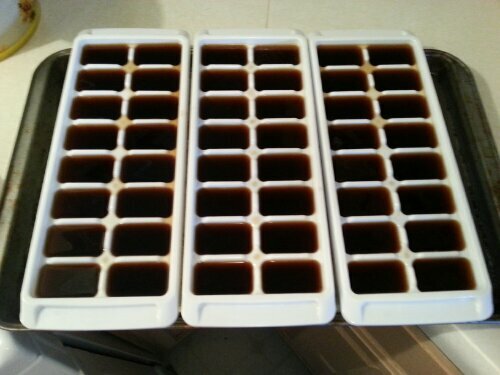 When they’re frozen, you can pop the cubes out and store them in a plastic freezer bag so you always have some on hand. Bone broth! An elixir of savory goodness! We’ve taken to drinking it like tea sometimes. It feels almost like a meal because it’s so filling and good for you. I read a few articles before my first attempt at making it. It turned out to be so much easier than I thought it would be! I use bone broth now in anything I might have used store bought broth in before. And I also use it to reheat leftover meats since simmering in broth for a bit makes them nice and tender. This stuff is truly a wonder. 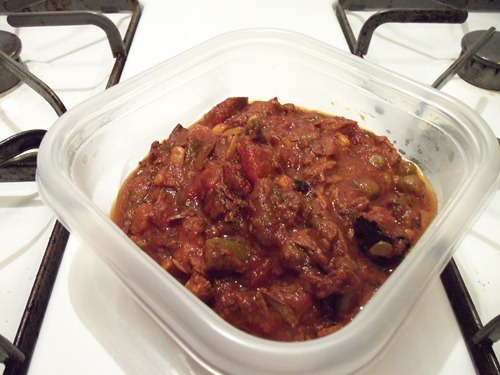 Recipes at the links: Dana Carpender’s is easiest I think. You have, no doubt, heard of the legendary healing powers of chicken soup. They’re for real. 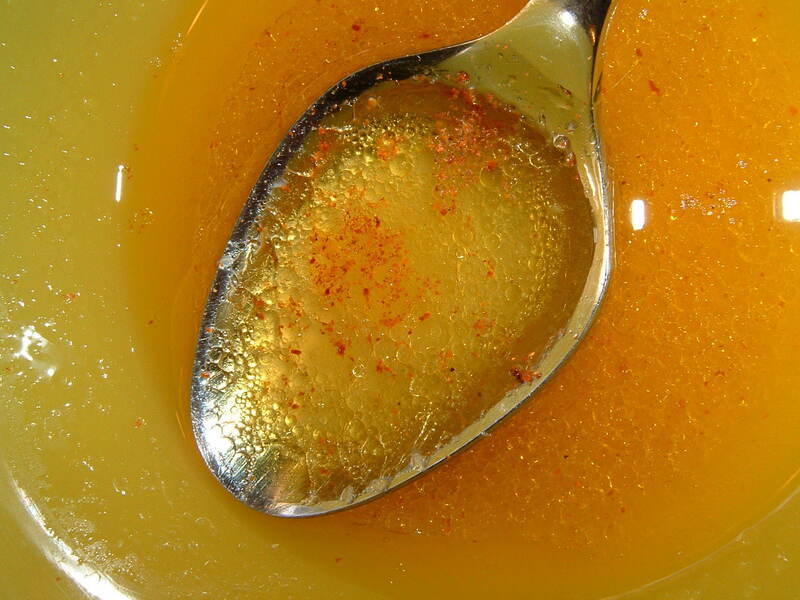 Why is Jewish Penicillin* good for nearly anything that ails you? Bone broth. * Or WASPy Penicillin. Or Asian Penicillin. Or Latino Penicillin. Whatever. Bone broth is an Equal Opportunity Healer. In short broth is one of the best foods you can feed your family. It is a multivitamin, a medicine for all kinds of sicknesses, and a delicious food wrapped up in one. It keeps you healthy, gets you even more healthy and helps you recover when sick. Since you control all of what is in your broth you don’t have to worry about allergies to hidden ingredients or cheap fillers. Broth is economical and good for the earth. It uses foods that you would be throwing away anyhow and makes more food out of it. via GAPS Basics: Basic Bone Broth Tutorial: Why and How. | Loving Our Guts. These are my beef bones after stewing for a couple days. This is how the broth turned out, after a double straining. 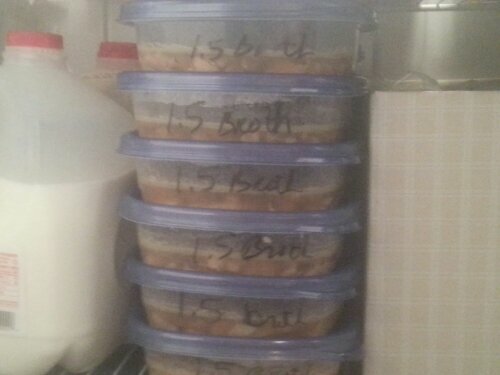 All my little 1 cup containers, filled with brothy goodness and ready to be frozen for use at a moments notice. This batch I portioned out with some leftover meat and veggies, so I had ready made meals for those nights when I just don’t feel like cooking. I’ve found a dry erase marker works great on the plastic containers. Rather than storing it in a single big bowl in the freezer, I portioned it out, along with some leftover chicken I had. I’ve found that using a dry erase marker on the plastic bowls is a great way to mark leftover stuff. It comes off when you wash the bowls, and it works great on baggies too. I hated trying to use tape to mark things that went into the freezer. What a pain! This way is so much easier. Now I have prepared meals ready to go, and I know exactly what’s in them. Double woo!